BARACK OBAMA IN THE WHITEHOUSE: What happened to Flight 447? NEW YORK (Reuters.com) -- So what happened to Air France Flight 447? It is early and speculation at this juncture is often wildly wrong. And remember, there are usually several factors that conspire to bring an airliner down. But here is what we do know for sure. Keep this in mind as you process the often inaccurate reporting on aviation that is so prevalent in the mainstream media. The Timeline - The flight, carrying 216 passengers and 12 crewmembers, left Rio de Janeiro at 6:03 p.m. Sunday EDT (7:03 PM local time). It flew beyond radar coverage 3 hours and 33 minutes later (at 9:33 p.m. EDT). A half hour later (10 p.m. EDT) - now four hours into the flight - the plane encountered heavy turbulence. Fifteen minutes later (10:15 p.m. EDT), now a long way out to sea, it transmitted an automated signals indicating the plane was in serious trouble. "A succession of a dozen technical messages (showed that) several electrical systems had broken down," according to Air France CEO Pierre-Henry Gourgeon. He described the failures, which included (most ominously) the pressurization system as "totally unprecedented situation in the plane." It was a dark and stormy night - in a place that is home to the world's worst thunderstorms. Just as it disappeared, the Airbus A330-203 was flying into a thick band of convective activity that rose to 41,000 feet. 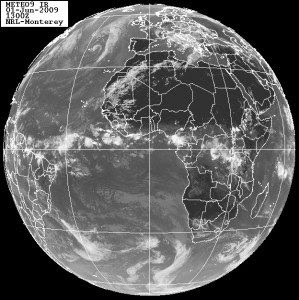 This equatorial region is known as the Intertropical Convergence Zone - it is where Northeast and Southeast Trade Winds meet - forcing a lot of warm, moist air upward - which condenses - an efficient thunderstorm producing machine. The crew had "Sully-esque" seasoning - The Captain had 11,000 hours total time (1700 in the Airbus A330/A340). One Copilot had 3,000 hours total time (800 in the Airbus A330/340) and the other Copilot had 6,600 hours total time (2,600 in the Airbus A330/340). The Airbus A330 has a good record - and this was the first crash of a twin-engine A330 in revenue service in its history. In 1994, seven employees of Airbus died when a 330 went down during a test flight. The accident report says it was a case of pilot error. The airplane that crashed last night - tail number F-GZCP - had no accidents or incidents in its history. It went into service on April 18, 2005 and had logged 18,870 hours. It was in the hangar in mid-April for routine maintenance. No serious squawks reported. No reason to believe terrorism - While you cannot take the possibility of a bomb off the list just yet, no groups have claimed any responsibility for downing the plane. What good is a terrorist attack if the perpetrators don't, well, terrorize us? So consider this as a possible scenario. The crew is flying toward a line of storms in the dark, out of range of land-based radar. They are equipped with on board weather radar however - and can use it to thread their way through the bad cells if need be. It is quite likely the airplane was struck by lightning - it could have triggered lightning by the mere act of flying at Mach .8 through storm clouds. It is not impossible that could have triggered a fuel fire - but that is highly unlikely. In fact, it has been four decades since lightning alone caused an airliner crash in the US. A lot of time and effort is spent protecting airplanes from the clear and present danger (interesting piece here). And airliners get hit by lightning all the time - you don't hear about it because nothing bad happens. Remember, it is seldom just one thing that brings a modern airliner down. And many of those airliners that get hit are so called fly-by-wire aircraft (meaning the controls in the cockpit are linked to the movable surfaces on the airplane by electrical wires and computers). Airbus pioneered FBW control systems in commercial airliners. And the engineers in Toulouse have gone out of their way to demonstrate their products are safe in stormy weather. There are four fully redundant electrical systems on an Airbus - and if the worst happens, a manual flight control system that allows the crew to fly the plane (barely) using the rudder, differential thrust on the engines and horizontal stabilizer trim. Ironically, one of the systems most vulnerable to lightning strikes is the on-board weather radar located in the nose cone. It cannot do its job if it is shielded from lightning like the rest of the airplane is - and so it is more likely to go down when bolt strikes (which is, of course, when you need it most). So it is possible this plane was hit by lightning, knocking out the radar. You can imagine the crew was suddenly preoccupied with multiple electric failures that left them in the dark, over the ocean and without weather radar as they hurtled toward some epic cumulus nimbus thunderheads. This would have been serious emergency that should prompt a pilot to do a 180 and head for the nearest suitable size slab of concrete. But consider this possibility: most Captains on long hauls over the pond prefer to be on the flight deck for take-off and landing. Was the most seasoned aviator in his bunk when the weather hit the fans? And then there is the Aribus rudder. You may recall the crash of American Airlines flight 587 on November 12, 2001 as it departed New York's JFK airport. The plane encountered some wake turbulence and the copilot apparently stepped too hard on the rudder pedals - breaking off the graphite vertical stabilizer and rudder (the tail). Even today's advanced - seemingly invincible airliners are no match for Mother Nature on a bad night. If a big airplane ends up in the teeth of a powerful thunderstorm, it could be torn to pieces in an instant. We do know whatever happened on that airplane in its last few minutes was nothing short of horrifying. It is hard to imagine the kind of turbulence that would break up an airliner. My heart goes out to the passengers and crew. Will we ever know what happened? This one will be hard. The wreckage will be likely strewn over a wide area - and locating the Flight Data and Cockpit Voice Recorders won't be easy since they are likely at the bottom of the sea - hopefully emitting their homing signals. But just knowing where to search will be difficult. One thing which may help: those automatic messages indicating system failures - which are designed primarily to give mechanics a heads up about problems so they can turn a plane around on the ground faster - no doubt contained much more information than is now in the public realm. Which brings me to one of my pet peeves: why not send steady streams of telemetry from airliners to the ground all the time - ala NASA and the shuttle? Imagine how invaluable that much data would be right now - given the distinct possibility this could remain an unsolved mystery. 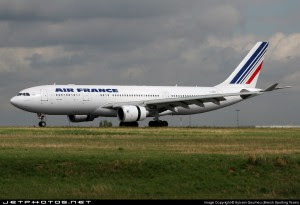 We all need to know what happened to Air France 447. Is there something that makes the A-330 fleet unsafe in certain conditions? In the absence of real facts, will conspiracy theorists spin a tale of terrorism and government cover ups? Did the flight crew make crucial errors in judgment? Or was this an unavoidable scenario - bad luck with odds so long that nothing or no one is really to blame?